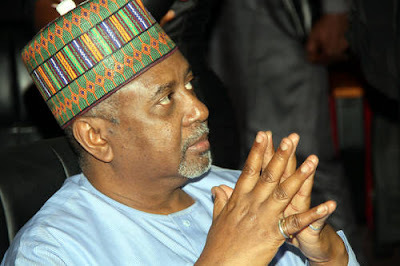 The Economic and Financial Crimes Commission on Tuesday accused the immediate past National Security Adviser, Col. Sambo Dasuki (retd. ), of compromising the security of the nation and committing economic sabotage through his alleged diversion of over N32bn meant for the purchase of arms to fight terrorists in the North -East. The commission, which also gave more details about the alleged diversion of funds meant for the purchase of arms by the office of the NSA during Dasuki’s tenure, said there were documents showing that the ex-NSA gave the approval for the release of the funds to the accounts of private companies and individuals for the procurement of arms. EFCC’s lawyer, Mr. Rotimi Jacobs (SAN), said this before Justice Yusuf Baba of the Federal Capital Territory High Court in Maitama, Abuja, while opposing the bail applications filed by Dasuki and his co-accused persons, who are being prosecuted on 19 counts of conspiracy, criminal breach of trust and dishonest misappropriation of the money. The other accused persons, who had pleaded not guilty to all the 19 counts on Monday, are a former Director of Finance and Administration in the Office of the NSA, Shuaibu Salisu, and a former Director of the Nigerian National Petroleum Corporation, Aminu Baba-Kusa, and two companies. The two companies, in which Baba-Kusa are their directors, are Acacia Holdings Limited and Reliance Referral Hospital Limited. Jacobs, who said the accused persons were still under investigation for other “aspects of the case”, added that the EFCC was still tracing assets linked to the proceeds of the diversion of the funds. The EFCC, however, alleged that Dasuki had purchased houses in London and Dubai with the proceeds of the funds meant for the purchase of arms for the soldiers battling the terror group, Boko Haram, in the North-East states. The defence lawyers, representing the accused persons – Ahmed Raji (SAN) for Dasuki, A. U. Mustapha for Salisu, and Solomon Umoh (SAN) for Baba-Kusa and his companies – had, while moving their respective bail applications, maintained that the charges filed before the court did not indicate that the money in question was meant for the procurement of arms. But Jacobs, in picking holes in the lawyers’ contention, referred the judge to pages 14 to 58 of the prosecution’s proof of evidence, which he said contained documents detailing the approval of the former NSA for the release of various sums of money to individuals and private companies for the procurement of arms. Jacobs said, “In our proof of evidence, we mentioned security money meant for purchase of arms. We also mentioned security equipment, but they decided not to look at it. In a counter-affidavit, deposed to by an EFCC detective, Hassan Saidu, the anti-graft agency alleged that the funds were released to private companies and individuals “who have nothing to do with the supply of security equipment or rendering security services”. According to the 19 charges preferred against the accused persons, Dasuki, Salisu and Senior Special Assistant, Domestic Affairs to the President, Waripamowei Dudafa, released N10bn to the Peoples Democratic Party for the presidential primary delegates. It was also alleged that N2.1bn was paid into the account of DAAR Investment and Holding Company Limited, controlled by one Dr. Raymond Dokpesi for the funding of media activities for the 2015 Presidential Election Campaign for the PDP. The sum of N1.45bn was also allegedly paid to Acacia Holdings Limited, controlled by Baba-Kusa, to organise prayers. Again, the sum of N750m was allegedly paid to Reliance Referral Hospital Limited in favour of Baba-Kusa for prayers. Belsha Nigeria Limited, controlled by Bello Matanwalle, was also said to have received N380m to support some members of the House of Representatives for their re-election campaign. General Hydrocarbons Limited controlled by Thisday publisher, Nduka Obaigbena was also said to have received N670m for “energy consulting”. The office of the NSA was also said to have paid N260m to a former Minister of Works, Chief Tony Anenih, who was also the Chairman of the PDP Board of Trustees, during the March 28 presidential election. Senator Iyorchia Ayu was also said to have received N345m for the construction of shopping mall at Jabi, Abuja, purporting the said sum to be payment for satellite charges and security equipment. EFCC said in its counter-affidavit that it was in the interest of the accused persons to remain in protective custody in order to shield them from being attacked by relatives of innocent soldiers who were drafted to fight Boko Haram without sufficient equipment. The affidavit read in part, “That the charges being alleged against the defendant/applicant (Dasuki) border on economic sabotage that strikes at the very foundation of Nigeria well-being and existence. “That it is in the interest of justice to put the applicant in protective custody so as to shield him from a possible attack by the relatives of the innocent soldiers, who lost their lives due to lack of adequate equipment; innocent soldiers who lost their lives due to lack of adequate facilities caused by the diversion of the funds meant for that purpose.